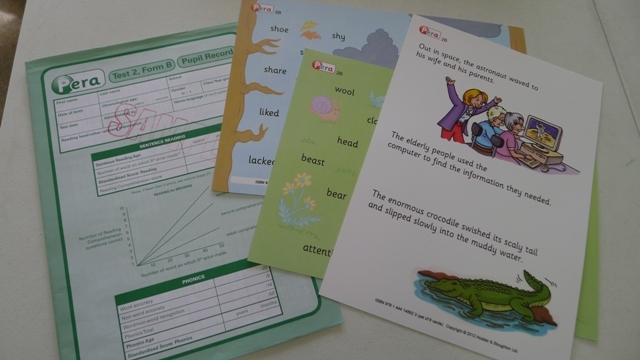 The Phonics and Early Reading Assessment (PERA) is a new reading test from the UK for children in their first three years of schooling. At first pass, it looks like a quick, affordable, objective assessment for specialists working with struggling young beginners, as well as early years classroom teachers who think of literacy as a skill to be actively and systematically taught, not a developmental mystery to be observed unfolding. I managed to get a friend’s six-year-old, a confident reader, to stop talking about Lego long enough to do the PERA (thanks, G and L), and have also tried it with little boy who has had to work hard to get off the literacy starting blocks (thanks to him and his mum too). And I read the not-at-all-daunting 60-page manual. Here’s what I found out. An informal, non-standardised pre-phonics assessment for absolute beginners who aren’t able to tackle Test 1 yet. I’ll come back to it in a minute. 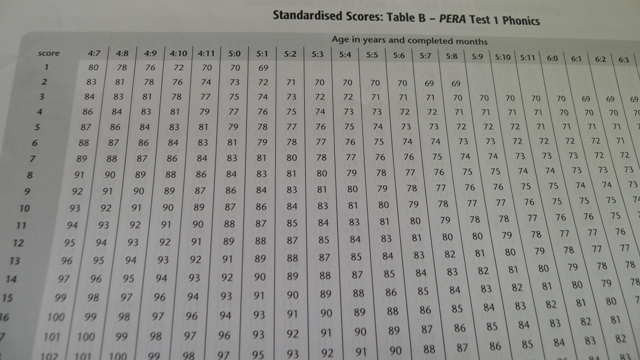 The PERA was standardised on 3500 UK children and includes age norms for children aged 4:7 to 7:10, so it’s possible to use this test to compare a UK child’s performance with others the same age. 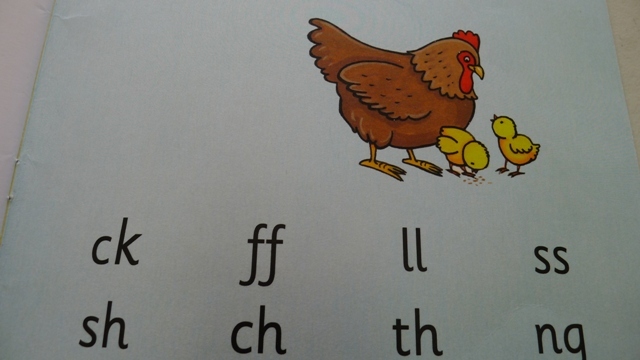 The test directly relates to the Letters and Sounds stages, which are widely taught as part of the UK’s mandatory early years Synthetic Phonics programs. A version relating to the Jolly Phonics teaching sequence is also available (thanks to Susan Godsland for pointing this out). Here in Australia, teaching about the identity, order and number of sounds in words (phonemic awareness), and how sounds are represented by letters (phonics), is typically a much more hit-and-miss affair. Our early years classrooms typically focus on rote-learning high-frequency words, initial sounds/blends, and guessing words from pictures and context. So the UK norms tables/age levels should be applied with caution to typical Australian children. If they haven’t learnt something about sounds and letters, it might be because they haven’t been taught it. This test could also be used with slightly older students who are still at the beginning stages of learning to read, to get a sense of how much progress they’re making in catch-up programs. However, the pictures and themes on the test aren’t suitable for angry older kids inclined to reject anything babyish-looking. How long does the PERA take? The manual says ten minutes or less, which seems about right, I took a bit longer but I was on Learner Plates. So it ticks the quick box. What are the test tasks? Reads up to ten sentences accompanied by pictures containing a total of 50 different words, then answers up to ten questions about the ones read correctly (not more than two words wrong). For scoring purposes, only the words read up to and including the fifth error are counted. After that, you can discontinue, or let the child keep going to the end, if asking them to stop might be disheartening. There are no sentences without accompanying illustrations. Reading 25 regularly-spelt real words. This tells you whether the child can read the word, but not whether they’ve memorised it or can sound it out. Reading 9 pseudowords, which are not real words in English but follow the spelling patterns of English (e.g. “prown” and “zight”.) This does tell you whether the child can sound out novel words. Looking at groups of similar-looking words and pseudowords (e.g. “thick”, “shick” and “chick”) and pointing to the 16 words the examiner says. This tells you whether the child can discriminate important details in the sounds and spellings of these words. Each test’s materials are printed on the six sides of three colour, laminated A4 cards. The last page of each child’s assessment form is for recording observations about fluency, expression, phonic strategies. engagement and any special circumstances on the day of testing e.g. Harry was having an Emo day, Sunita was off all last week with the dreaded lurgy. Identify a rhyming word, or a word that starts with the same sound as a given word, by pointing to a picture. Blend three sounds into a word and point to its picture. Say a sound for each of 24 letters and 8 digraphs (ck, ff, ll, ss, sh, ch, th, ng). Point to the letter(s) at the beginning or end of a given word. Blend 2 or 3 sounds into words where the spellings contain digraphs (e.g. t-ai-l), and point to its picture. Answer some spoken questions about the test pictures. If they struggle with these questions then a referral to a Speech Pathologist is recommended, which IMHO should happen anyway for any child whose comprehension or expressive language seems to be low. The PERA also includes a set of Aural Comprehension Questions to use if a child’s Reading Comprehension is poor, and you want to work out whether this is a reflection of weak listening comprehension (as per the Simple View of Reading). However these questions generally require children to provide spoken answers, so the task requires both comprehension and expression, either or both of which might be weak. The manual doesn’t offer any help with interpreting responses to the questions, so I’m not overly keen on them, because teacher training in auditory comprehension seems to be quite variable. Children with poor reading comprehension which can’t be explained by poor decoding should be referred to the school Speech Pathologist for a language assessment. Is the PERA easy to score and interpret? The front of the child’s test form has a space to record the child’s Sentence Reading Age, which is absolutely straightforward to work out, without even having to look in the manual. Just find their fifth error on the Sentence Reading task. Their Sentence Reading Age is printed underneath it. However, be careful not to count errors on repeated words (which I did at first) or you’ll score it incorrectly. 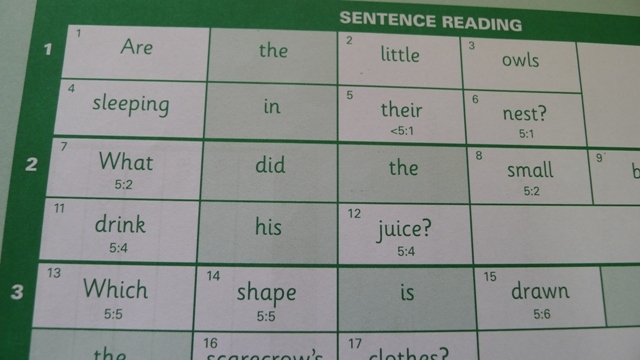 Words repeated in the sentences are greyed (or in the above example, greened) out on the test form, and not counted as part of the 50 assessment words. The tables in the back of the manual allow you to look up a child’s fifth error against their chronological age, and find their Standardised Score: Reading. As is usual in standardised tests, the theoretical average Standardised Score is 100 and the average range is 85-115. Children with Standardised Scores below 85 are below average, and probably require intervention. Children with scores below 90 are worth watching closely. 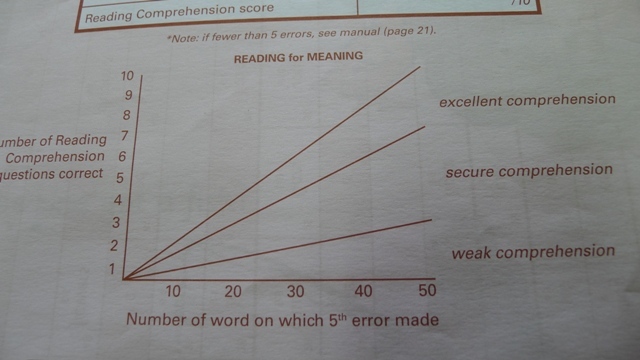 A child’s answers to the Reading Comprehension questions are scored out of 10, but there’s no table where you can look up what this means, just a graph on the front of the test form where you can plot this in relation to the child’s 5th error, to get an idea of whether the child’s comprehension is “excellent”, “secure” or “weak”. So this is pretty vague, but once a teacher has done the whole test with everyone in the class, this should add to their understanding of who’s comprehending and who isn’t. However, teachers need to be wary of false positives.The strong reader I assessed went right off-topic during the comprehension questions because one of them was associated with a picture containing a church, and he’s currently fascinated by religion, on account of his best friend from kinder going to a religious school. So his comprehension score was quite low, but having recently listened to him read, and had a lengthy, enlightening conversation with him about the story and (you guessed it) his love of Lego, I’m not worried about his language comprehension. To work out a child’s phonics score, you add up the word and pseudoword reading and recognition scores, to get a Phonics Total out of 50. 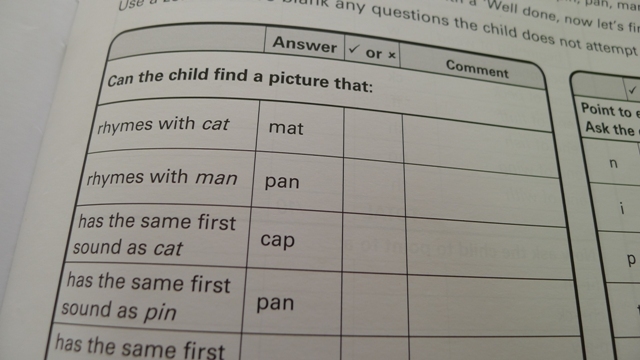 A table buried on p 22 of the manual converts this to a Phonics Age, and another table at the back of the manual allows you to look up the child’s Standardised Score: Phonics. Again, the average is 100, the average range 85, and anyone scoring under 85 probably needs extra help. The manual also provides tables of average scores at different ages for each subtest, lists showing how easy/difficult the standardisation sample found each of the words, and six short case studies. This section of the manual has headings like “No matter what I do, I can’t get him to remember his sounds” and “She’s struggling to notice digraphs – she just sounds out the letters separately“, and “When she reads, she puts in words that aren’t on the page“. Each is followed by suggestions of what to consider/do. Nice. How much does the PERA cost? The test manual, cards and a sample copy of each record sheet used to cost AUD$132.95 from ACER, but as of 2017 it seems to only be available from the UK. Packs of ten test forms were $26.95, and these are not photocopiable. So the per-child cost to test 40 children was $6.00 each, and obviously the more children you test, the closer you get to the minimum per-child cost of ~$2.70. Speech Pathologists get very little, if any, change out of $1000 for the average language test, and each language test form typically costs ~$10. The two York Assessment of Reading Comprehension tests (primary and secondary) set me back about $1000, and the forms cost $4.95 each. So from where I sit, the PERA seems very reasonably-priced. Could the PERA be used for school-entry screening? When they start school, some children can’t read anything and don’t know any of their letters, while others are already reading simple books. That’s fine as far as I’m concerned, I’d be quite happy if children spent their preschool years developing their oral language, play, social, motor and other developmental skills, and were only taught to read once they started school. The PERA is not designed for school entry screening, it’s designed for use with children who have had six months of synthetic phonics-based literacy-teaching at school. However, its Pre-Phonics Assessment could be used for screening, though it doesn’t have any norms or criteria to use as the basis for decisions about who needs extra assessment and/or intervention. The School Entry Alphabetic and Phonological Awareness Readiness Test (SEAPART) is an Australian, criterion-referenced test that is designed for school entry screening purposes. The SEAPART costs the same as the PERA ($132), takes ten minutes and its forms are photocopiable. I haven’t tried it myself but the person who wrote it, Dr Roslyn Neilson, knows her stuff. Note that ACER currently doesn’t sell the SEAPART to teachers, but I understand Ros is trying to rectify this, and that teachers can buy it from her direct. 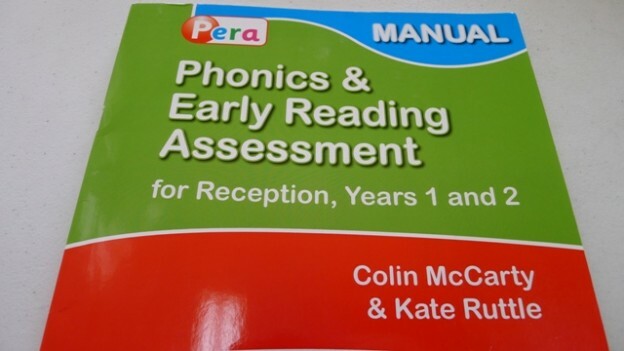 Authors: Colin McCarty, a test developer, and Kate Ruttle, a senior primary school teacher. Available from (as of 2017) Hodder Education in the UK. 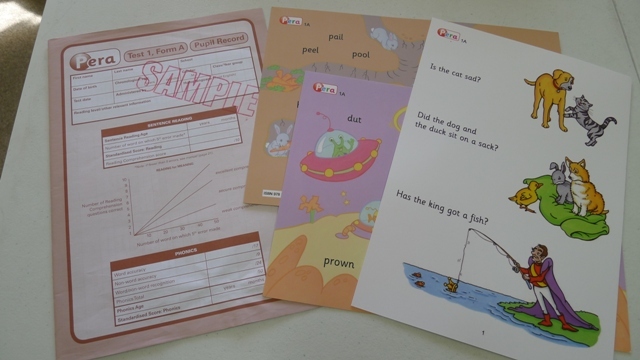 The PERA is a fast, affordable, easy-to-use standardised test of sentence reading and real and pseudoword reading, suitable for use with children in their first three years of schooling, and slightly older strugglers. It contains four different tests, so can be used to measure change over time. It also includes a nice pre-phonics assessment, and user-friendly case studies and intervention suggestions. The reading comprehension section should help teachers identify children whose poor reading is based on poor oral language comprehension, not just poor decoding, and refer them to a Speech Pathologist for a language assessment. I hope that as Australian teachers start using this assessment, it helps them focus their teaching more on decoding and less on memorising and guessing. And I hope someone does an Australian PERA standardisation soon. This entry was posted in assessment, phonics activities, reviews, teaching strategies on July 27, 2015 by alison. Thank you very much for this very detailed review of the PERA resources. It must have taken you a very long time! Please can you clarify if there are any 'plain texts' for the comprehension assessments – for example, sentences or paragraphs provided without accompanying pictures of words and meanings featured in the written material. I suggest that the PERA assessment of comprehension would have been better with 'plain' texts without the picture clues!